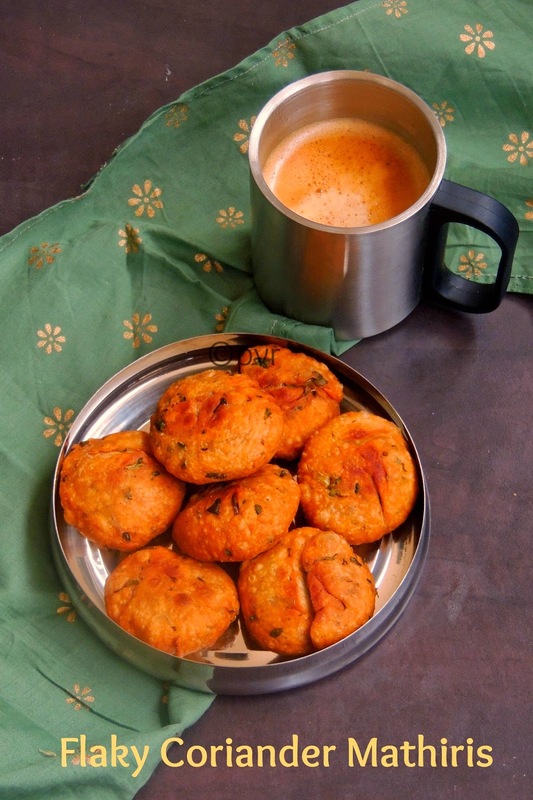 Mathiri is one of most famous North Indian snacks, i always want to make at home. There are two varieties of Mathiris,one is the thin,flat and very crunchy mathiris prepared by rolling the dough as thin disc which is later shaped with a cookie cutter, the next one is the thick,spicy and flaky ones. Mathiris are in my to do list since a long, but i couldnt make them earlier for some reason. But today i got an opportunity to make this thick,spicy,flaky mathiris for a cook challenge, yes this mathiris are this month's challenge for the Southern team of the South vs North Challenge an event owned by Divya Pramil. This month's host for the Northern team is me and i have challenged our opposite team with my native's special Munthiri Pakodas/Cashew Pakodas while Nupur of Uk Rasoi challenged us with this thick flaky Mathiris as the theme for this month is Evening Snacks, yes we have themes from last month and seriously am enjoying this themed challenges, so that we can cook from each category as some foods are very unknown for both teams na. Coming to today's mathiris, this thick mathiris can be prepared easily, if you have all the ingredients with you. Thank god, coriander leaves will always be there in my fridge while other ingredients are the usual ingredients you can see them easily in your pantry.Do you know this flaky mathiris are very addictive and one cant stop with just a mathiri, these mathiris came out extremely flaky, served with mango pickle and a cup of coffee everyone at home enjoyed happily this flavorful,aromatic mathiris. 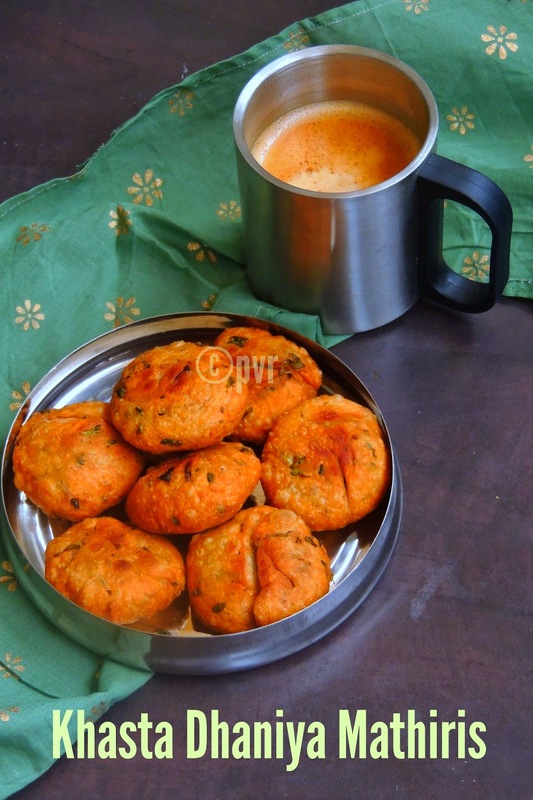 I have to say a big thanks to Nupur for pulling me to make this mathiris finally at home.Nupur suggested to make this mathiris either with both wheat and maida or simply with wheat flour or else with maida, i went for more wheat flour and less maida. Sieve the flours together and add all the spices, slowly knead everything as a hard dough. It will harder than the chappathi dough, once done cover the dough with a damp towel,keep aside for half an hour. Once the dough is set, knead again and divide as small equal balls, flatten each one with a palm gently. Fry the flatten balls in small batches, give enough space to get fry. Since these mathiris are thick, cook them in medium flame until the mathiris gets light brown. Drain the excess of oil with paper towel and let them cool. Arrange in an airtightened box and enjoy with a cup of coffee. This looks perfect & yummy!! They look very flaky and delicious! They look perfect with that cup of tea..
they look like a nice snack to eat with a a hot cup of tea. tempting mathris. would taste great with a cup of coffee.. Delicious and lovely looking mathari. Pics look amazing as well. These looks flaky and delicious, can't wait to try them! I normally use kasoori methi.. But I am sure even these must be flavourful. Oh these look amazing. I can't wait to try making these at the weekend.